Uncommon early map of the West Indies. 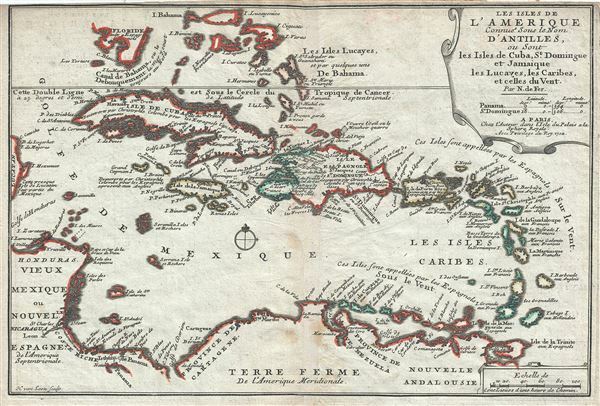 Les Isles de L'Amerique Connues sous le Nom D'Antilles, ou Sont les Isles de Cuba, St. Domingue et Jamaique les Lucayes, les Caribes, et celles du Vent. This is a scarce and attractive 1702 map of the West Indies by Nicholas De Fer. It covers the Caribbean from the eastern coast of Yucatan east as far as Barbados and from the southern tip of Florida south to Trinidad and Tobago. Includes Cuba, the Bahamas, Puerto Rico, Jamaica, Santo Domingo, and the Lesser Antilles. Renders the region in detail offering both topographical and political information. Florida is misshapen with no trace of the Keys. A note near Florida and Cuba references the Gulf Stream as always flowing north. Further south, the West Indies are fairly well mapped suggesting a relative accurate picture of the islands. There are several references to the explorations of Christopher Columbus. This map was engraved by Harmanus van Loon and created by Nicholas De Fer for his 1702 atlas of Spanish possessions. Fer, Nicholas de, Cartes et Descriptions Generales et Particulieres pour l'intelligence des affaires du temps, au sujet de la Succession de la Couronne d'Espagne, en Europe, en Asie, Afrique, et Amerique, (Paris) 1702. Very good. Minor wear along original centerfold. Original platemark visible. Minor overall toning and some spotting. Top margin cut off.